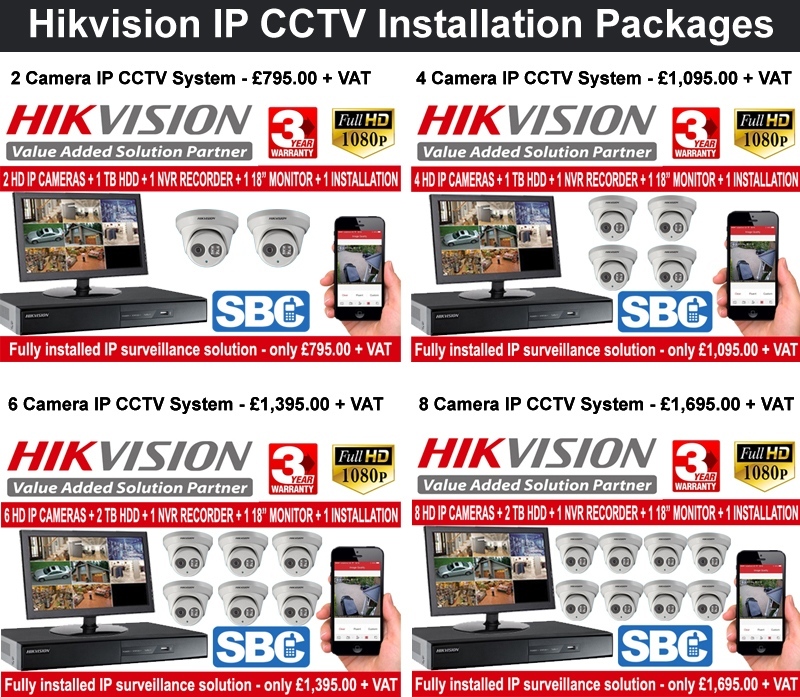 Hikvision IPDVS CCTV Systems supplied & fitted from only £795.00 + VAT. We’ve been getting asked a lot from customers if we offer smaller fixed CCTV packages including installation. So, we’ve put together a selection of deals for you, whatever your requirement and budget! To see our range of superior camera deals between 2-8 IP cameras – click here. All of our packages offer very latest award-winning Hikvision technology at the most competitive prices and come with everything you need including the NVR recorder, IP Cameras, CAT5 Cabling, HDMI leads, 18″ Monitor, remote device setup (e.g. iPhone, Android, iPad), network setup and 3 Year Warranty. Simply put… IP cameras are the future! In fact, most manufacturers have already stopped producing analog cameras. A few of the many benefits of IP CCTV include, higher image resolution day & night, enhanced remote access and enhanced features. In addition, installation is much simpler and tidier than archaic systems – you have a single CAT5 cable from the NVR to the camera, for both data and power. This eliminates the need for power outlets at IP camera locations and allows IP Cameras to be deployed up to 100m away with a PoE. Need more cameras or a bespoke solution? We appreciate that one size doesn’t’ fit all so we listen and understand what is needed and then develop a bespoke CCTV package to suit your specific requirements. Whether it is for your home or business, we can design a CCTV system to meet your exact requirements. Explore your next CCTV system today!